It’s easy to miss fascinating details while reading the Gospels—but it’s also rather exciting, because when you finally do notice these details, you appreciate them so much more! A few months ago, I had a particularly striking thought on the story of Christ’s appearance to the Apostles in the upper room, first without Thomas, and then with Thomas. It's so easy for us, who are far removed from the actual event, to “tsk, tsk” Thomas for refusing to believe the other Apostles and for daring to ask to touch the wounds of the Word Made Flesh. But I think Thomas gets a bad rap unnecessarily. There’s much more to this story than meets the eye! Where In The World Was Thomas?! All the Apostles, grown men—some of them burly fishermen—were hiding behind a locked door “for fear of the Jews.” But Thomas wasn’t there. Regardless of whether he "drew the short straw" to go get food for the “hangry” crew of Apostles, or whether he snuck out to see his family and tell them what he knew of the past days’ events, Thomas wasn’t hiding out in the upper room. He faced fear while the others were cowering. Can you imagine how Thomas felt when he came back from his errand and found that either his brother Apostles had gone insane or that Christ had allowed him to miss a fantastic encounter? If I were Thomas, I would have found that to be rather unfair. After all, he wasn’t afraid to go out and risk the danger of the city and the possibility of being recognized as one of Christ’s closest followers. This boldness of Thomas isn’t an isolated incident. If we go back to an earlier passage in the Gospel of John, in which the disciples fear for Jesus’s safety when He wants to go see Lazarus in Judea, Thomas tells the others, “Let us also go to die with him” (Jn. 11:16). Thomas wasn't afraid to proclaim his true thoughts. In this instance we see a bold, confident boast—and then in the upper room a bold and bitter doubt. Christ, in His mercy and wisdom, takes this fearless man and gives him the opportunity to turn that bitter disappointment into a beautiful prayer of adoration. I always thought that reading Christ’s appearance to the Apostles on Divine Mercy Sunday was simply for liturgical reasons. But now I see that this passage also perfectly fits because Thomas experiences God’s Mercy. Thomas, though he doubted, was not afraid to make an appeal to Christ and acknowledge the littleness of his trust in God. 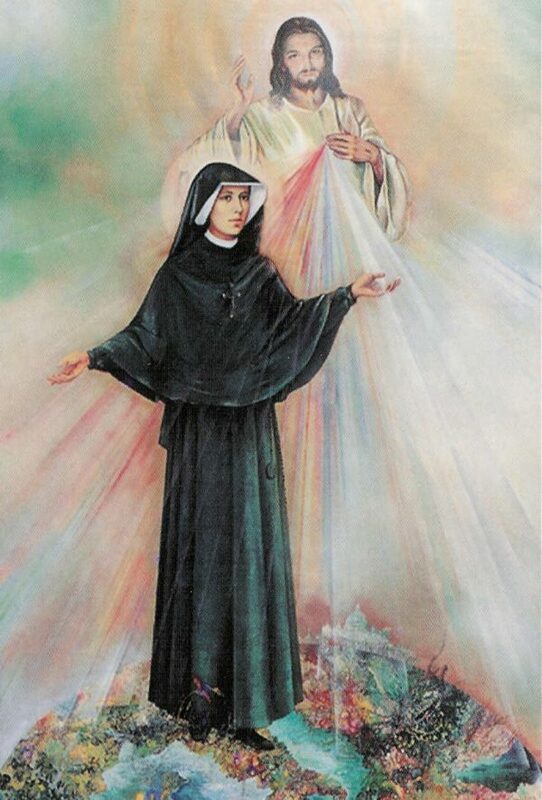 As Christ told St. Faustina, He cannot resist the soul who appeals to Divine Mercy. Therefore, Christ takes Thomas’s weak faith and gives Him a tender moment beyond his wildest hopes. Thomas probably didn’t think he would ACTUALLY get to touch the wounds of his Lord. His plea was simply a cry of frustration and doubt and desire. I’ve used the term “Apostle of Divine Mercy” several times now, and I like it more each time I use it. I think it’s a much more accurate and thoughtful title than “Doubting Thomas.” No one wants to be famous for doubting. But I sure wouldn’t mind being called an Apostle of Divine Mercy, up there with such promoters of mercy as St. Faustina and Pope St. John Paul II! As the Feast of Divine Mercy approaches, let us ask for this humbled saint’s intercession, so that we will turn our doubts and fears into offerings to the Merciful Heart of God. 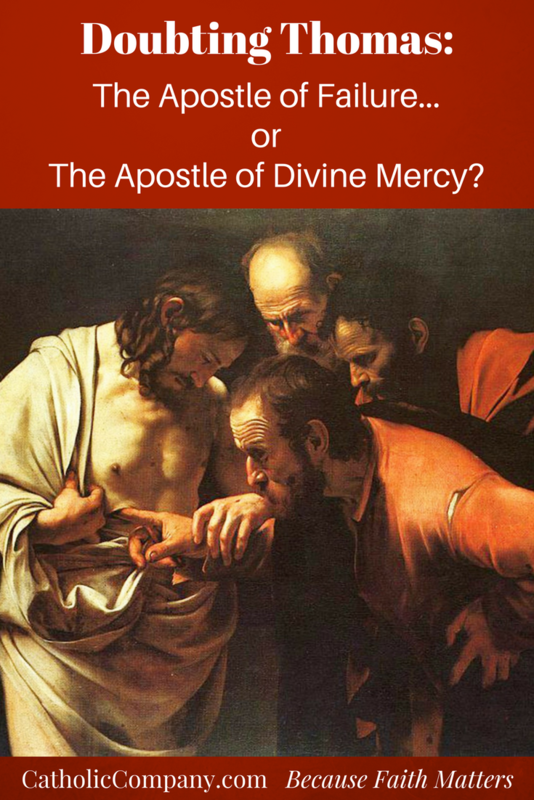 St. Thomas, Apostle of Divine Mercy, pray for us! Thank you for this wonderful article. 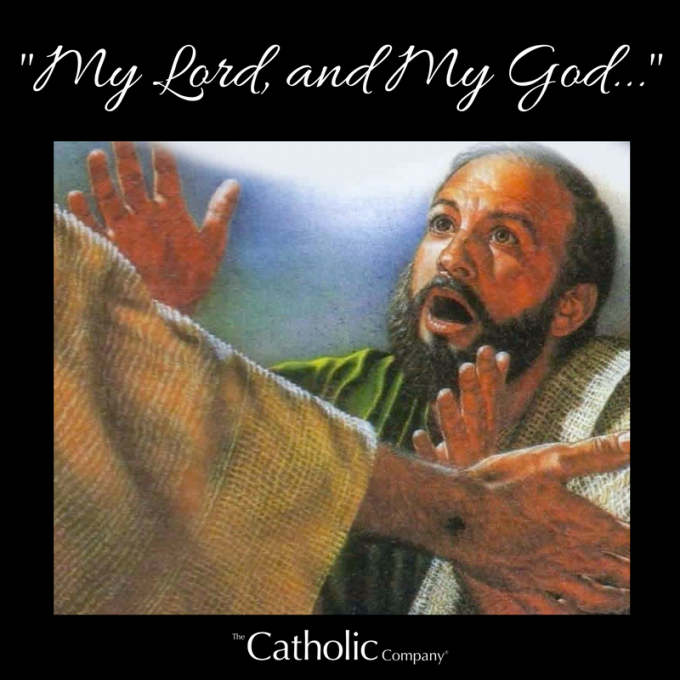 I am Thomas and I pray "My Lord and My God " during the Consecration. I love my patron saint and I love Jesus and know in my heart He loves me in spite of my addictions and bad habits !! Thanks again. Thank you for a beautiful article! 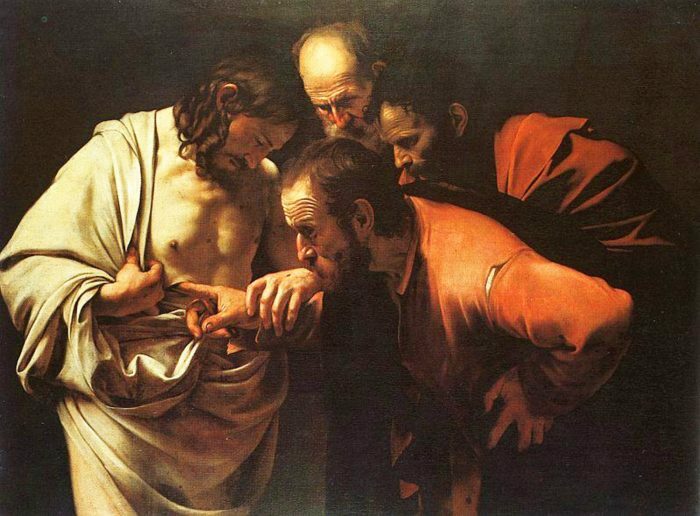 Yes, I agree, St. Thomas should be known as the Apostle of Divine Mercy, and not as doubting Thomas. I am one of the people who pray, "My Lord and My God," during the Consecration. My first school and church was Saint Thomas the Apostle with a beautiful mosaic on the altar of that moment with the words My Lord and My God around it. As a child, I felt sorry for him not being with the apostles but never thought to question why. This is a lovely reflection on a Saint whose reaction was as human as any to the other apostles extraordinary claim. Christ's mercy toward him and gentle rebuff of his momentary disbelief is one of the first (if not the first) post resurrection cases of his Divine Mercy. I Always say do not be too hard on the Apostles for their shortcomings. They had not yet received the Holy Spirit. That happened later for them at Pentecost and we all here and now have this wonderful gift. What a beautiful reflection! Thank you so much for enriching my prayer regarding that moment of "doubt."